Science in transition is the name of an initiative of scientists from Dutch universities and research institutions (and foreign researchers). It began in April 2013, organizing workshops and publishing position papers. On the website, it states: ‘Science is in need of fundamental reform. That is the belief of the initiators of Science in Transition. 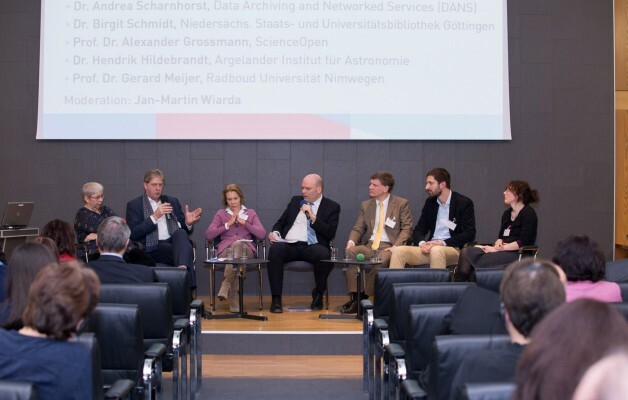 Science has become a self-referential system where quality is measured mostly in bibliometric parameters and where societal relevance is undervalued.’ This could also have been the summary of the two day conference, ‘Innovating the Gutenberg Galaxis. The role of peer review and open access in university knowledge dissemination and evaluation’ organized by the European Academy of Technology and Innovation Assessment, on 26-27 January at the Academy of Sciences and Literature in Mainz, Germany. Two COST Actions, PEERE and KnoweScape, joined forces to bring together international experts to discuss changes in peer review and challenges in open access (OA). We discussed what could be described as the shock waves resulting from the ongoing earthquake of new digital technologies, which so profoundly influence new knowledge production practices in all scholarly and scientific areas. But to see the changes in science as a response to technological changes only is too much of a short-cut. The changes in the science system take place in the socio-economic context of globalization and neoliberalism, including cuts in public funding, an emphasis on economic valorization, increasing competition for external funding, precarious job positions, and the closure of university departments. (During the workshop some attendees followed the online discussions of the faculty meeting at Bonn University where the closure of the Information Science Department was discussed and decided, 1000 students and 10 lectures are concerned – and many international and students protests in vain). But, despite being reflexive and critical the meeting did not carry a pessimistic tone. On the contrary! New technologies open up new possibilities, partly breathtaking, new means to carry the academic discourse, for machine-supported knowledge discovery in the growing bodies of knowledge, for remote collaboration including data documentation and archiving, and for new forms of OA publishing and Open Science. But it also became clear that the division of labour inside the science system and in its surrounding ecology are currently being re-negotiated. This is prominently visible in the negotiations between universities and scientific publishers for licenses. 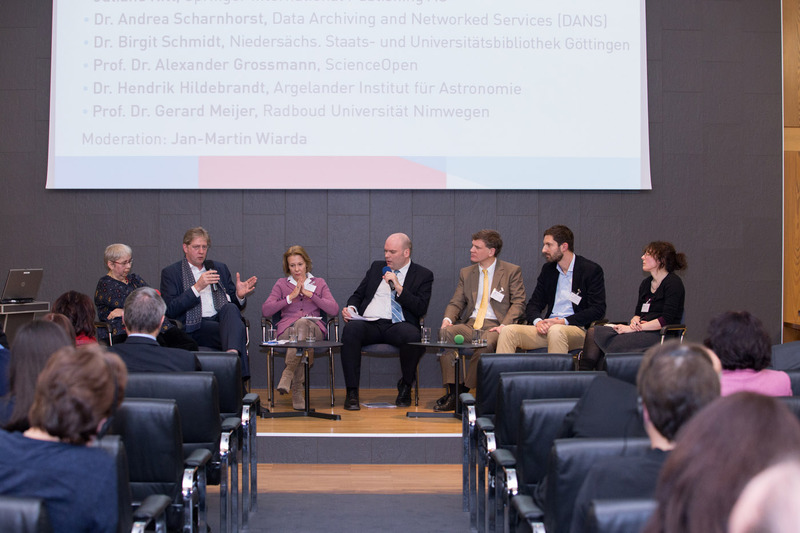 Science publishers are redefining their role, and so are academic libraries, and so are publicly funded research information providers, such as national portals as NARCIS in The Netherlands, or OpenAIRE on the European level. The general tone was caution – behoudend innovatie . There was a plea to not destroy working structures before having new ones – such as the established scientific publishers. Or caution to not do all what is possible, but to make selections. To give an example related to open data – the fact that one can store everything does not mean one has to. There was also a call to seek to benefit from generic solutions, but at the same time to allow diversity. Throughout the debate it became clear that all stakeholders will need to give something in return for the potential benefits, the stakeholders including publishers, the academic institutions, and the technological pioneers. Peer review is at the very heart of science, academic freedom and integrity but there is little known about its working. How do we teach our students peer review? Do senior colleagues share their peer review practices? How should peer review be supported in times of big science and publication rush, when there is little reward for the invisible or care work involved in peer review, data documentation and archiving, popularization, and interdisciplinary collaboration. Despite the fact that data and interdisciplinary collaboration are on every science agenda, careers are still very much domain determined (ACUMEN) and data are not easily shared (RECODE). Open Access and Open Science entail the possibilities to widen and accelerate access to automatically supported information (knowledge) discovery. The creative process of knowledge production can best be served by access for all and wide dissemination. The reality is far from this ideal. There are opportunities, such as easier checks against falsification and plagiarism, and the provision of platforms for voices outside the established elites; but there are also dangers, such as predatory OA journals which abuse OA as business model. It is important that the OA community engages in ethical discussion as much as Peer Review needs more articulation and ethical reflections. The OA advocates should not fight against each other, but join forces to rescue OA from being reduced to a business model and piracy by unscrupulous publishers. At the end of the conference, Petra Ahrweiler pointed out that OA and Peer Review can be interpreted as two different mechanisms in the evolution of science: Peer review is a kind of selection mechanism, contributing to the classification and evaluation of ideas and knowledge; Open Access is a great source for innovative ideas – mutations so to say. Each complex system – drawing on the language of general evolution – needs to balance between mutation (the creation of new ideas, variants) and selection (keep only some of those). As one of the pioneers in self-organisation theory, Ingo Rechenberg, once wrote, there exists a small window in which complex systems can exist, function in a stable manner, and still be adaptive enough to evolve further. The boundary of this window is a mutation catastrophe where anything goes at the one end and a lock-in where only one solution exists at the other – highly vulnerable to any external change. Such an evolutionary view is also applicable for both the cognitive organization of the sciences (the diversity of ideas and the canon of disciplines) as well as for its different layers of socio-political and economic organization. To the latter belongs the complex system of scholarly communication with its parts: internal and often invisible (= Peer review) and external and visible (publication = public documentation and open access to it). Both, Petra says, need to be in balance, but at the same time the boundaries between them become blurry. So, what we witnessed during the two days were reflections on ongoing re-negotiations around each of the both factors and their mutual dependency. That this took place in the presence of science policy makers (Festakt); international – with inclusion of researchers from all European countries, also from smaller and less wealthy countries, and driven by all generations of researchers – feels particularly appropriate, given the mission of COST which supported this meeting through two of its Actions.